I love the Healthy World, Healthy Child boxes. They are boxes with organic products, that are designed to host a party to inform people about having a more organic lifestyle. You make a $25 donation and receive a box filled with goodies. Organic Valley Sandwich Box. Value??? $5?? 10 painting pages- value, $1? There were several coupons some included Earth Friendly Products: 10 coupons for $1 off a product and Plum Organics: 20 50 cents off coupons. There was a "coupon" for $10 off Baby's Only. However, it was a generic code freely available online. Total value: $79.71, which is not bad for a $25 donation. Please also note that although the value of the boxes is very similar, the items inside the boxes may differ. 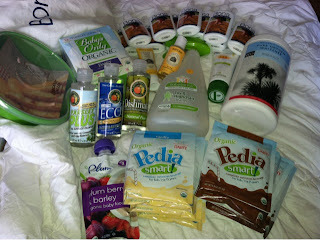 For example, Mama Jo got the above box, while Mama Steph got a box with body wash and laundry soap samples, while Mama Jo got Bona Floor Cleaner and the Plum Organics. Wow, that's a nice box of products for just a $25 donation! What an awesome box! And a lot for the donation!